We care about Analytics Systems, because by understanding where we stand, and where our Executive teams stand, we better understand why we succeed or fail. Take this brief, two-question quiz. You'll understand where you fall on the grid. Answer how your Executive team might respond, and plot where they fall as well. Plot the answer to the first question on the following chart ... (1) on the left, (5) in the center, (9) on the right. Plot the answer to the second question on the following chart ... (1) on the bottom, (5) in the center, (9) on the top. If you and your Executive team aren't plotted near each other, you've got the potential for communication problems. Analytics Systems matter, they represent the difference in philosophy that divides or unites us. 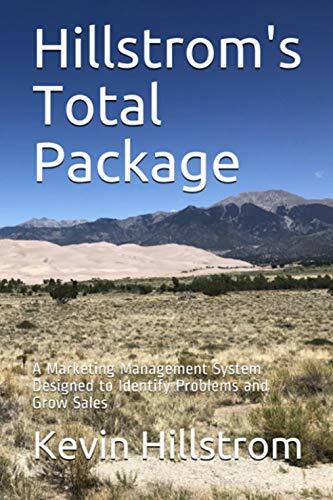 Here's an old-school example: Catalog marketers often employed a Segmentation/Forecasting hybrid model to measuring advertising effectiveness. For instance, Lands' End used a segmentation strategy with "current" customers, followed by 0-3 month recency, 4-6 month recency, 7-9 month recency, 10-12 month recency, and beyond in three month increments. Eddie Bauer and Spiegel used a similar strategy ... "current" customers, followed by 0-6 month, 7-12 month, and beyond. This segmentation strategy served dual purposes. First, catalog performance was measured within each segment, and that was important (part of the Segmentation system). Just as important was a subtle twist incorporated within a Forecasting system. Customers were locked-into the segment at the start of a quarter/season, and only moved out of the segment into "current" quarter/season status if the customer purchased. January 1 = 0 Current Season Customers, 100 0-3 Month Buyers. June 30 = 67 0-3 Month Buyers. 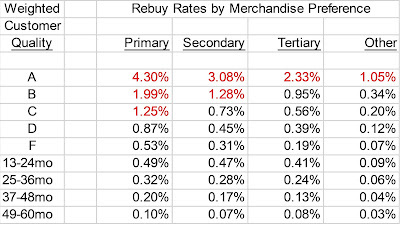 Rebuy Rate For 0-3 Month Buyers = 1 - (67/100) = 33%. This was a subtle, but very clever implementation of a Segmentation/Forecasting hybrid system. The analyst knew how customers performed in each catalog (Segmentation --- understanding marketing campaign effectiveness), and just as important, the analyst was able to understand overall repurchase dynamics independent of marketing activities, and understand file strength implications for upcoming quarters/seasons (Forecasting --- understanding and forecasting customer performance independent of marketing campaigns). 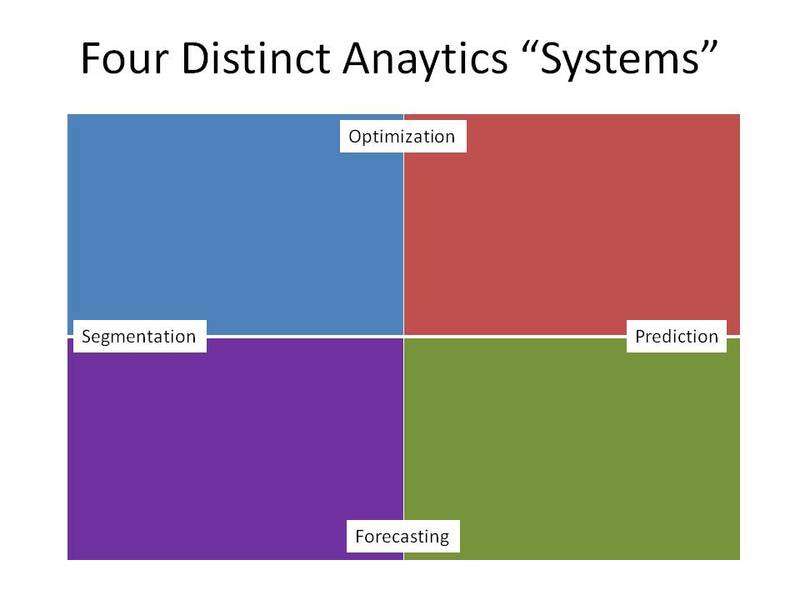 Back in 2001, I was trying to implement an Optimization/Prediction hybrid system, so I abandoned this type of segmentation scheme at Nordstrom ... the decision did not sit well with a faction of individuals who were loyal to the Segmentation/Forecasting hybrid system mentioned above. Heck, it was as if I just obliterated all analysis reporting in the company!!! My decision was not popular, at all ... when you and Management are far apart on the systems grid, it doesn't matter how bright you are, you're in big trouble. Web Analysts frequently run into this reality, just read their tweets, calling Executives "HiPPOs", meaning "Highest Paid Person's Opinion". You see, the Web Analyst often uses a Segmentation system that is hard-wired into the software solution used by the Web Analyst. The person the Web Analyst is trying to convince frequently uses a Forecasting system ... take a merchant, who only cares if merchandise sells, pure and simple. This person isn't evaluated on the performance of an individual catalog, this person is evaluated on customers loving her merchandise on an annual basis. These are two individuals, running two different systems ... the merchant wants to know what is going to work in the future, the Web Analyst cares about what happened to conversion rates last month. When individuals run different systems, disagreements happen. 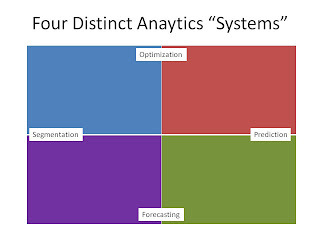 It's really important to know where you stand on the Analytics System continuum. It's just as important to understand where your Executive team stands on the continuum. If you're in a similar place, you are united. If you're in different places, you may be divided against each other.